Nano aquariums, along with the word stunning, are all the rage at the time of writing. Here at PlanetCatfish.com we are, it has to be admitted, perhaps not among the most fashion conscious. However I write this month's short CotM article about a rather short fish that could be fashionable but, thankfully, I can avoid increasing the over use of the word stunning to describe it. Indeed, if you print out this species' name, Tridensimilis brevis, in even quite a small type face, that printed name would be twice as long as the physical fish. This then is a real nano catfish and its addition to a nano tank will not strike fear into the hearts of cherry shrimp or Riccia (it's a plant, I know it doesn't actually have a heart, but you get my point) - this fish is plant and shrimp safe. These dwarf parasitic catfish are really unusual additions to a small tank and their small mouths will not eat adult shrimps or plants. Being as small and transparent as it is, it is actually noteworthy that it came to anyone's attention; it is testament both to this fishes wide distribution and the diligence of the Eigenmanns that described it over 120 years ago in 1889. It rarely comes to aquarists attention either and is almost exclusively found for sale as a by-catch with species such as Corydoras pygmaeus or similar looking mini characins. It's easy to overlook even in aquaria as it is a mid water always moving clear fish - again something that endears it to those running the smaller aquarium. 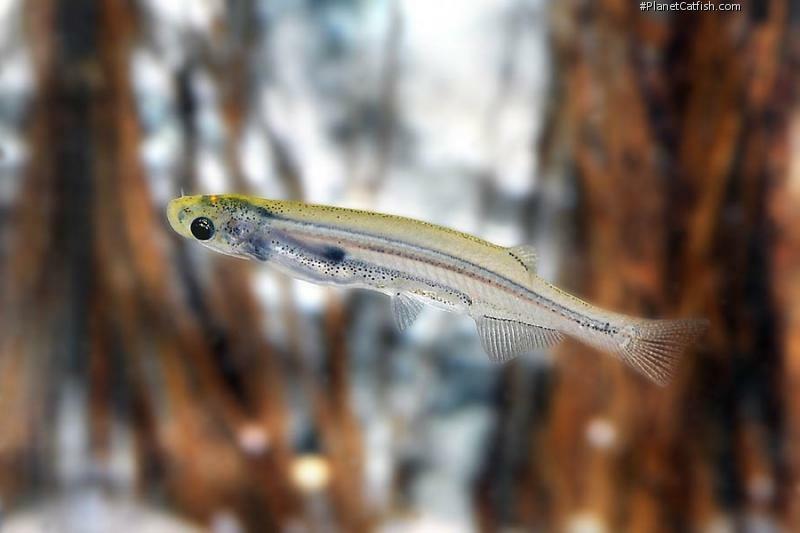 Don't let the parasitic common name worry you, that refers to the family name and while this species is clearly a carnivore (most easily fed on chopped bloodworm or similar that can be seen in their stomach through the fishes transparent body), it will be safe with .5"/1cm fishes or upto 1"/2cm. There is the possibility this species will begin to become parasitic with fish larger than that, although I did not observe this. In summary, the perfect curio for a pretty nano tank - your challenge is to find them. Type Locality Tabatinga, Amazonas, Brazil. Etymology Tridensimilis: From the Latin similis, meaning equal; this genus was named after its similarity to the trichomycterid genus Tridens (from the Greek tri, meaning three and dens, meaning teeth; in reference to the number of interopercular spines). Size 28mm or 1.1" SL. Find near, nearer or same sized spp. Identification Minute species of Catfish, usually actively swimming in the water column, at other times resting on plants or substrate. Tiny barbels visible on close examination (particularly when feeding). Body is remarkably transparent, the organs are enclosed in a silvery sac, although the stomach contents and other areas of the alimentary tract may be visible. There are two dark pigment spots on the body, one in the humeral area, the other on the caudal peduncle (this spot actually appear to be made up of pigmented skeletal elements as opposed to epidermal pigment). Sexing Unknown, although females may show ovaries through body wall when gravid. Distribution This particular specimen originated in a shipment of Corydoras pygmaeus from Peru. The genus would appear to be widely distributed across the Amazon region, into the Maracaibo basin of Venezuela. Other Parameters Large water changes not appreciated, very regular small changes optimal. Strong flow not required. Feeding Small Live Crustaceans, Worms, Insect Larvae taken eagerly. Dry food ignored. Incipient parasitism. Furniture Not important. Sand or bare base probably best. Compatibility Complex and variable. No problems with small characins, but there is some evidence that they are opportunistically lepidophagous on slightly larger fish under some circumstances. It has been observed that they will attack large ultra peaceful fish e.g. Doradids. There are no intraspecific compatibility problems observed, a larger group needs to be assembled to gather more information. References Proceedings of the California Academy of Sciences (Series 2) v. 2, pp 54.